This month a new feature story on Astons from the archives of the Kangaroo Stable. Previously unpublished, detailing the history of the Aston that never was. This month the "The Towns Vantage"
A new feature, tales from behind the stable door! Starting this month we'll be adding a new section featuring stories on Astons from the archives of the Kangaroo Stable. It will feature a new article each month, previously unpublished, detailing the history of unusual Astons rarely seen in public. This month begins with the "Zagato Mule"
Farewell old chum...the passing of a legend! It is with great sadness that I report today's passing of Roger Stowers, long time historian and archivist of Aston Martin Lagonda. I was privileged to be his friend and this site and my ownership of Astons is in no small part due to his kindness, encouragement and enthusiasm. I first met Roger as a 17 year old after hitching a ride to the factory In Newport Pagnell on a visit from my home in Australia. Even though I was too young to drive and certainly couldn't afford an Aston at the time he welcomed my enthusiasm and encouraged me to one day become an owner. An impromptu tour of the factory sent me home more determined to one day have a Vantage in my garage. Now that three reside there, vetted and approved by Roger, all a testament to his help and the friendship we built up over the last 25 years. I still have fond memories of letting Roger loose on the racetrack in Portland Oregon in my Vantage when he last stayed with me. Many fellow owners with have similar tales of the man's kindness and inspiration, their ownership encouraged by factory visits he so ably led with a love of the marque that will be sorely missed. Aston mystery solved...it's all in a name! There's a joke going around Aston circles after the open day at the new Gaydon facility. What's the name of Aston Martin's robot (the first in the companies history)? Hand (Aston can now claim the new DB9 is built by hand!) For more details of the open day have a look at the AMOC report at this link. Hand built at GAYDON The PR guru at the factory contacted us indicating the waiting list for Vanquishes had eased as production is now up to 550 cars per year, or 12 each working week. Considering the level of hand assembly required for each vehicle this is a remarkable rate of production. DB7+2 = Vanquish Vanquisher! Not since Ford bought Aston Martin have they produced a car worthy of the name...that is until now. At last they deserve full praise for a car, the new DB9, set to make its debutant appearance at the Frankfurt Motor Show this coming week. 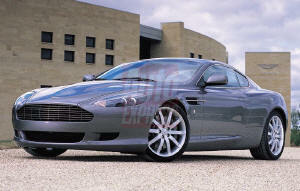 Tempting though the AM V8 Vantage was when launched at Detroit earlier this year, the DB9 is the car that will make or brake the company. 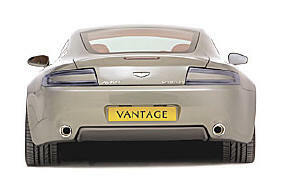 With 50% of its components to be used in the smaller Aston the new car serves as a proof of concept for the VH alloy chassis architecture and gives Aston time to refine production methods at the new Gaydon factory before the launch of the V8 Vantage in 2005. Developed in-house and close to budget it makes the Vanquish seem decidedly ordinary. A bespoke interior, room in the back for two, new suspension and a transaxle gearbox offering ideal weight distribution make it look a bargain against the price of its big brother. After the DB9 announcement this week those few still on the dwindling waiting list for the Vanquish may consider changing their orders. Aston may revamp their supercar before its put out to pasture in a few years by incorporating the DB9 interior and bringing forward the Vanquish Vantage to keep the order books full. It's certainly interesting times at Newport Pagnell, whoever thought they'd get vanquished by an upstart insider from up the road! 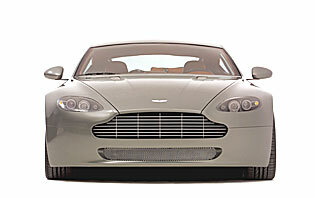 For more pictures of the DB9, including the full interior visit this link at Auto Express. The information within this website is provided for educational purposes to parties interested in learning about the Aston Martin Automobile. It is true and complete to the best of my knowledge. This is not an official web site and has no connection with Aston Martin Lagonda Ltd nor the Aston Martin Owners Club and is not authorised by them. Some words, model names, logos and designations appear on this website in pictures and text where they are used for identification purposes only. 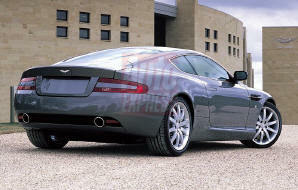 They are the property of Aston Martin Lagonda Ltd., Aston Martin Owners Club and registered copyright owners. Please do not reproduce any part of this website or images on these pages without my express permission. As this is an educational site permission will be readily given, in most circumstances.